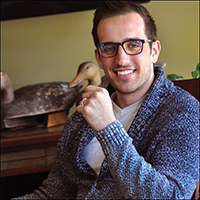 Take note from self-publishing Outskirts Press author, Nate Dinet, who is taking his latest book, Conquer Life, on tour – a virtual book tour, that is. He will be featured on several blogs over the weeks and months ahead so keep your eyes peeled to learn more about him and his book. 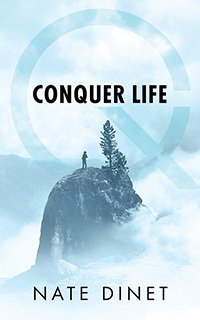 Luckily for us, Nate was kind enough to answer a few questions as the tour was getting started so that we can give you a sneak peek into the mind of the creator of Conquer Life. OP: Tell us a little bit about Conquer Life. What is it about? Nate: Conquer Life is a guide designed to get the reader from whatever their current situation is in life, to their desired state. Meaning, this book gives insight on how to manage your life to achieve your dreams and goals. I put you in the driver’s seat and take the ambiguity out of getting things done so the only real question is, how bad do you want it? If you want to achieve your dream, this book will give you the tools to start your journey towards the desired state of life. Nate: I absolutely believe that everyone in the world can do anything they want to, if they want it bad enough. But I also know a lot of people (like me) struggle to get traction on working towards their dreams or goals. A lot of people I coach spend time spinning their wheels and don’t know how to start or can’t gain momentum because they succumb to self-criticism or are simply blocked by from the outside world: work, school or otherwise. I wanted to give people a “how-to” for achieving their dreams, with no strings attached. Thusly, if you want it bad enough but don’t know how to get from point A to point B thru Z, Conquer Life can help. Nate: I used an awesome company called: Outskirts Press! They are a great self-publishing option for new authors. Everything is very streamlined, and the process is fantastic. Nate: Although I definitely have a very candid and unique voice throughout the book, I think it can appeal to most everyone. But who I hope picks up the book is anyone who finds themselves in a weird “transition” point in their life. For those who are just out of college, but their first job isn’t anything close to what they thought it would be, or for those who know they are missing something in their life but don’t know what that something is exactly, I hope they find Conquer Life – or maybe Conquer Life finds them. Could be like a Jumanji situation where it seeks out readers. Though, I wouldn’t want any of those negative impacts that comes with that autonomous board game. Nate: My book is just enough information, just in time. You won’t find theoretical debates on the human condition in it. I designed the book to be a quick guide so that the reader can absorb what they need to so they can start enacting change in their life, right away. My book is also full of my unique sense of humor so hopefully I can get a couple laughs but more importantly my humor is there, so the reader knows I’m with them the entire way. I want readers to know that I will be their coach, I’m not some get rich quick guy spewing nonsense their direction. I love helping people, plain and simple and I think that theme is evident throughout the book. Nate: Conquer Life takes proven methodologies that many of the most successful companies use to create new products and stay competitive in their market place and applies it on the micro scale for the individual. There are so many self-help books out there, but Conquer Life leverages the same foundational elements that make companies like Google, Microsoft, and John Deere (just to name a few) incredibly efficient. My book gives the reader what they need to operate in the most efficient way to achieve their dreams. Nate: This is my first published work! Nate: I am currently working on two separate books at the moment, a pseudo sequel to Conquer Life and a thriller novel. I’m targeting to get the first draft of each of the books complete by the end of 2018. OP: Thanks for your time, Nate! We look forward to learning more about you as you visit other bloggers! My name is Nate Dinet, and I am in love with my beautiful wife, Caitlin, and the proud father of our adorable daughter, Mia. For several years I have acted as a coach for organizations, helping them change the way they operate to enhance their efficiency in developing new products. While working in this environment, I found myself applying the same principles I used to help the organizations in my personal life with outstanding results. Now my focus has shifted from helping enterprises to helping individuals. My approach in Conquer Life is to be your hands-on coach, and I hope you give me that chance by picking up my book! Previous Previous post: Announcing the Reader Views & Benjamin Franklin Awards Winners!